BEN NORTON: It’s The Real News, I’m Ben Norton. This is part two of our discussion here with Prabir Purkayastha. Prabir is the founder and editor of the website, NewsClick. In part one, we discussed the recent General Assembly election in Karnataka, a major Indian state, in which the far-right ruling party, the Bharatiya Janata Party, the BJP, surprisingly did quite well and won dozens of new seats, while Congress, the Indian National Congress, which has dominated politics in much of the country, lost dozens of seats. In this second part, we’re going to discuss the politics of the BJP, which Prabir describes as a “politics of hate.” And we’re going to provide information for viewers who might not follow Indian politics as to what exactly the BJP is and other related groups, like the RSS and the Sangh Parivars, and how their politics is dominated by a far-right Hindu nationalism known as Hindutva. PRABIR PURKAYASTHA: This is a very interesting formation, that the Rashtriya Swayamsevak Sangh, what you are calling also the “Sangh Parivars”- the RSS is actually the political organization. The electoral front of this political organization is the BJP. It has a number of other organizations, which all form a part of what would be called the Sangh Parivar or the Sangh Family. And this has RSS at its core. And RSS, from the beginning, has had an exclusionary nationalist agenda which identified India with Hinduism. So, that’s- Hindutva is what you talked about. And it’s not a party which ever- RSS was never a party, organization, which participated in the national movement, the fight for independence of India. So, for a long time it was illegitimate, and the fact that they were implicated in the murder Mahatma Gandhi, assassination of Mahatma Gandhi, meant also their illegitimacy continued for a very long time. Unfortunately, the Congress- which gave up its nationalist agenda and followed the neoliberal agenda that allowed BJP to come back, or RSS to come back, into Indian politics- argues that if foreign capital and nationalism are not issues- this is not economic, nationalism is how we identify India, then obviously, cultural nationalism is the only thing that identifies India. 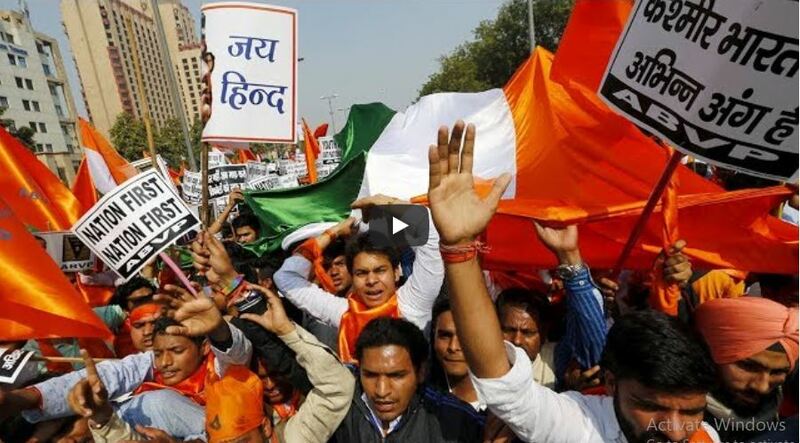 Therefore, the Hindu identity is the only basis on which Indian nationalism can form. So, this has been the argument of, shall we say, the narrative of the BJP, and at the core of this BJP narrative is really the RSS, which controls many more organizations. BJP being, as I said, its front, or its electoral front, as it were. BEN NORTON: And then, finally- I hate to ask fellow journalists to try to predict what will happen, because you know, we frequently report on it, but I think it’s good to have this perspective. Looking forward toward the 2019 general election, with the rise of communal violence, of violence against women and the rise of, as you mentioned, this politics of hate, these far-right political forces, do you predict BJP doing even better than it did in the 2014 election, or what do you see coming down the road? PRABIR PURKAYASTHA: I think the waning, shall we say, attraction of Modi- the fact that he’s no longer being taken that seriously, though he still maintains a certain credibility- the fact that more people are laughing about him, that more people are talking about the fact that he makes all these grandiose promises and claims that are substantiated by work on the ground- is something that’s going to go against that. It’s also the fact that hate politics has a shelf life. That you can do it for one year, two years, maybe five years- how long can you do it? And a lot of the Northern states have been doing it for quite some time now. So, I think this is also been leading to consolidation of different kinds of forces who are against the BJP, particularly the social network. And it will take, also, the fact that a lot of the, shall we say, oppressed classes in India, castes in India, are feeling the pinch of demonetization, as we talked about it, joblessness, various other things. If you take all of this account and also the big bank scams that have taken place, which all have taken place in Modi’s regime as well. So, if you take all this into account, I think you are going to see at least a loss of majority of the BJP. In the 2019 elections- as you said, crystal ball gazing is, of course, a very good pastime for journalists, and I do it all the time. So, I’m not ever going to be the exception. But I would say, yes, I do expect BJP to lose seats, to the extent that it will not be a majority after 2019. Can it run the country with other coalitions, can it run the party with other parties coming forward to support it, is a question mark. But will they accept Modi, who has shown himself to be extremely autocratic and authoritative even within the party and outside the party, even with its allies? Will they agree to Modi, then, being the prime minister? These, I think, are open questions, and I think 2019 elections, which can now be brought forward, they said, because BJP may not want, and Modi may not want to have three electoral defeats in the three northern states. Before the general elections, they can try and bring it forward. They have that option and have combined elections of the three states, as well as the national elections in 2018 end. So, we have to see how this pans out, but I do think you will see a reduced majority of the BJP. Whether that leads to defeat or its political, larger political agenda, of hate, that is something that we have to think about. And I don’t think that is going to be defeated, only because of the electoral setback that BJP will have in 2019. So, I think we have difficult times ahead, not only electorally, but also at the political level, to beat back this politics of hatred, the politics of divisiveness, which is what the BJP is promoting. BEN NORTON: Well, unfortunately we’ll have to end our discussion there. I was joined by Prabir Purkayastha. He is the founder and editor of the website, NewsClick. Thanks for joining us, Prabir.